We’re tooling up at the homestead. The plan is to raise 150 chickens this spring. 150 chickens means that we’re going to have 150 chicks. At least. We need a bigger chick brooder. Last year, we used a plastic tub. The tub worked well for six chicks. I’d like a chick brooder that can handle 50 chicks. I love Kingbird Farm and appreciate Cornell putting up these videos. I just wish it didn’t cost so much to take a class from them. I like the Ohio Brooder design except for the inset top. I think it’s a pain to make. 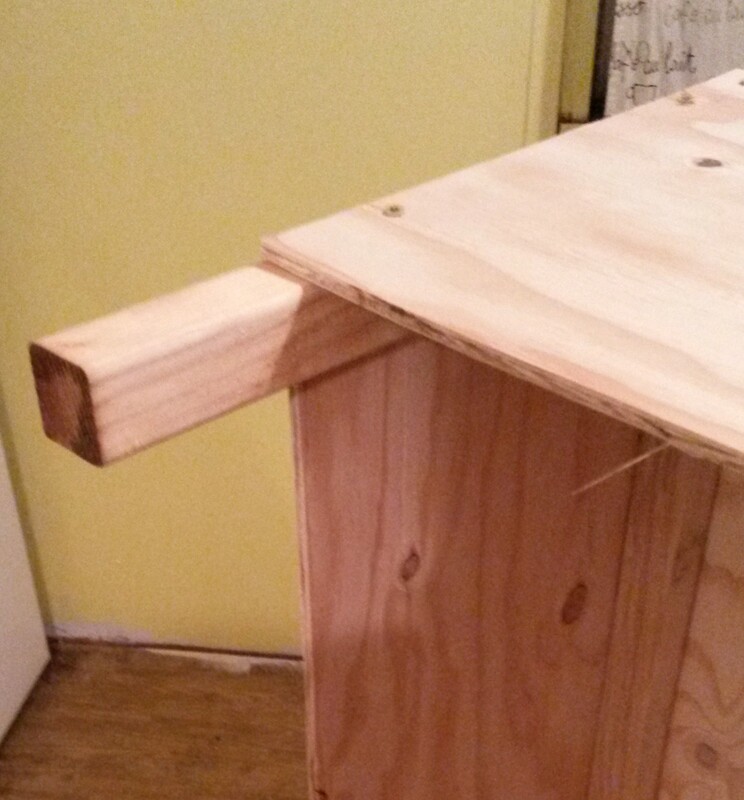 I think that I can add insulation without needing to drop the brooder ceiling. I did the same thing to another sheet but made sure that I left a space that equaled the thickness of the 1 x 1s on each end. I then cut the sheets down the middle. This left 4 sheets. They’re the sides of the brooder. 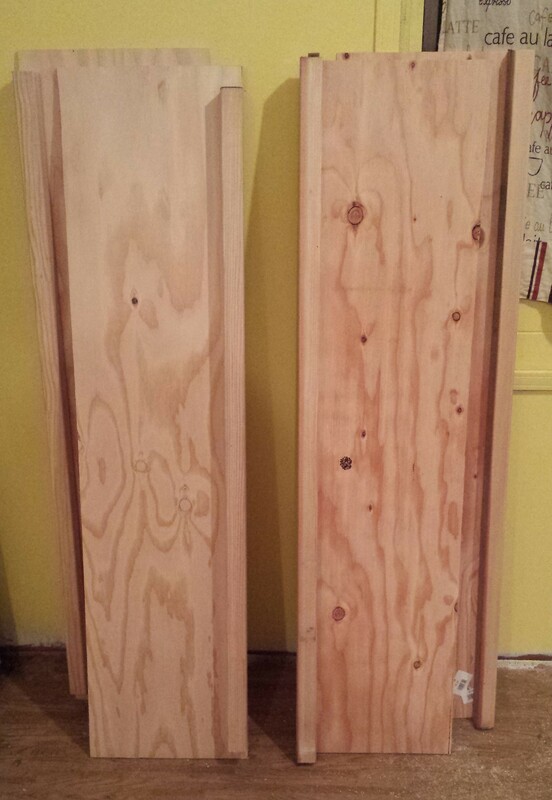 I set the sheets down, resting them on their long ends with the 1 x 1 edge up. They make the sides of the brooder. I screwed them together. 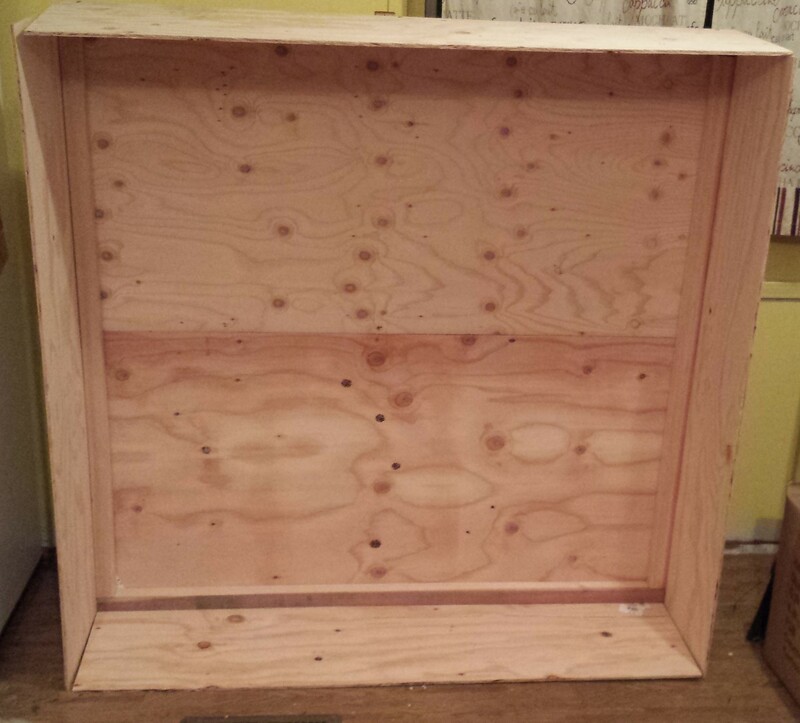 Next, I took two more sheets of 2 foot by 4 foot plywood and covered the top. 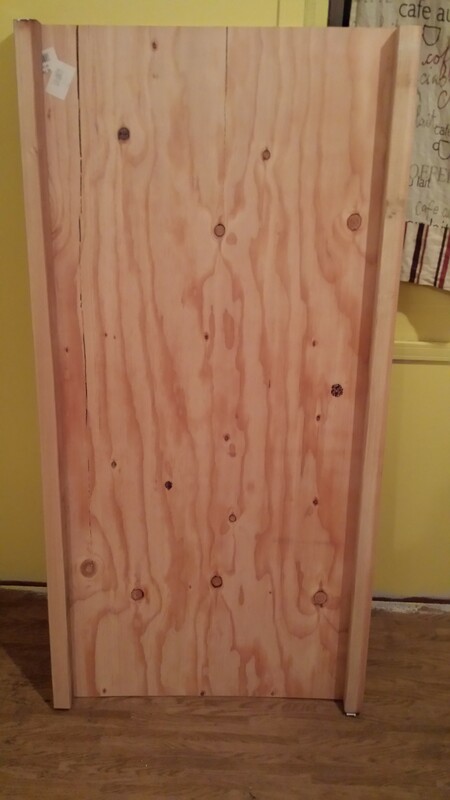 Hopefully, you have a a 4 foot by four foot piece left from your original sheet of plywood. The next step is to add feet. 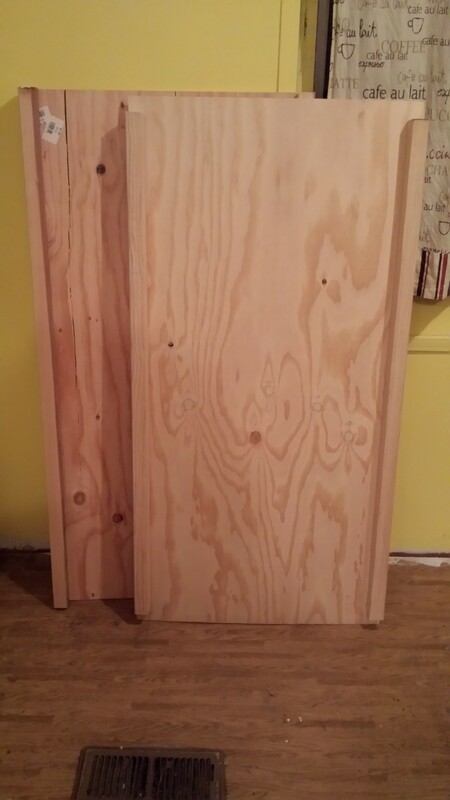 Cut some 1 inch by 1 inch lumber to fit inside the corners. 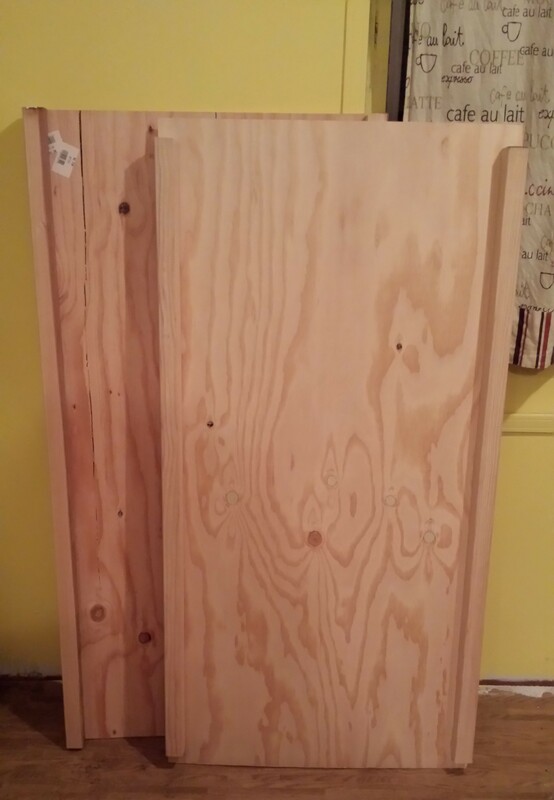 The wood should extend past the box by four inches. 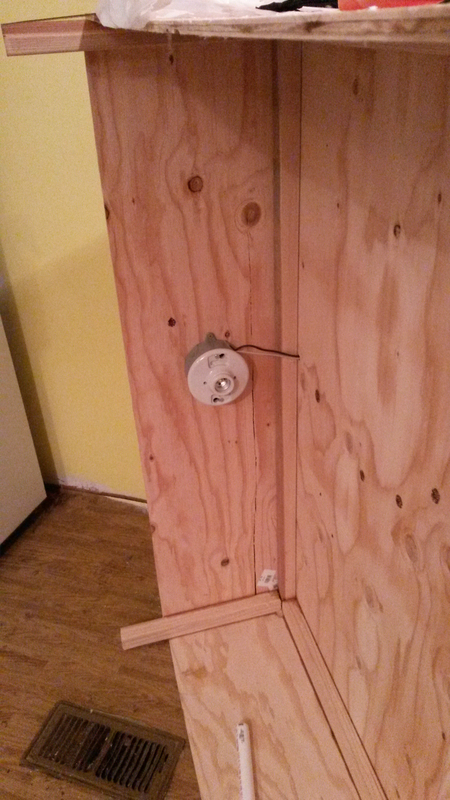 I mounted two electrical boxes on opposing walls inside the box. I poked a hole in the ceiling above each box. I ran two wires from one box to the other, through the holes. I had some wiring left over from my fence charger project. Basically, these are wires stripped out of Romex. I used these wires . 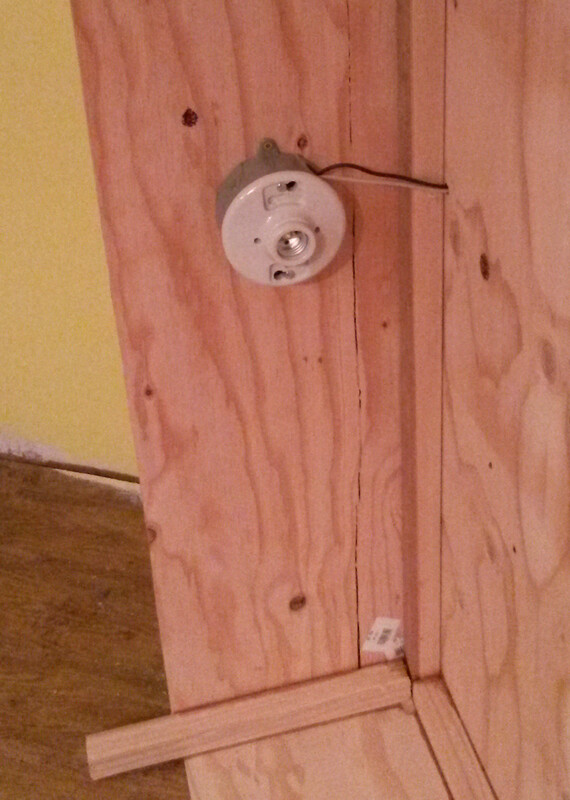 I wired the fixtures. 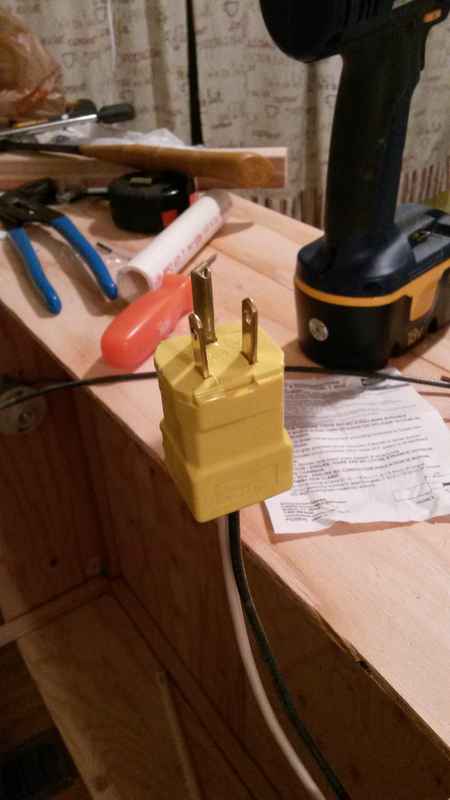 I put a second set of wires into one of the electrical boxes. 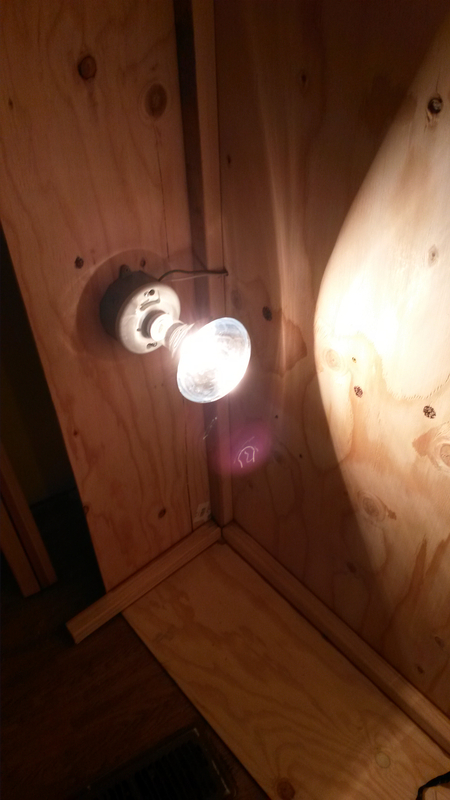 I wired the two fixtures and the second set of wire in the box using wire nuts and screwed down everything. I added light bulbs (using 250 watt infra reds) and plugged in. Did you blow a breaker when you plugged in? Your two wires are touching where they’re bare or else grounding out on something. Only one light came on? 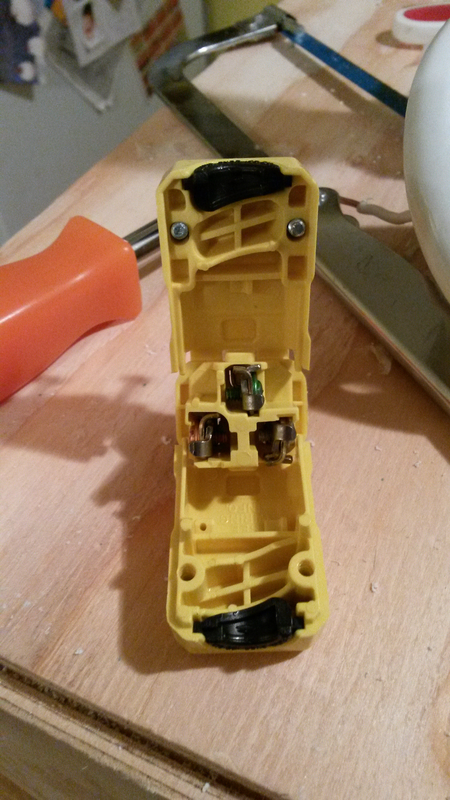 Check where you spliced your wires together. I use wire nuts to tie my wires together. Then I tape them with electrical tape. Chances are something is loose. No lights came on? Check breaker. Check Plug. Check splices. Still no love? Get a multimeter. Now I get to make 3 more of these. 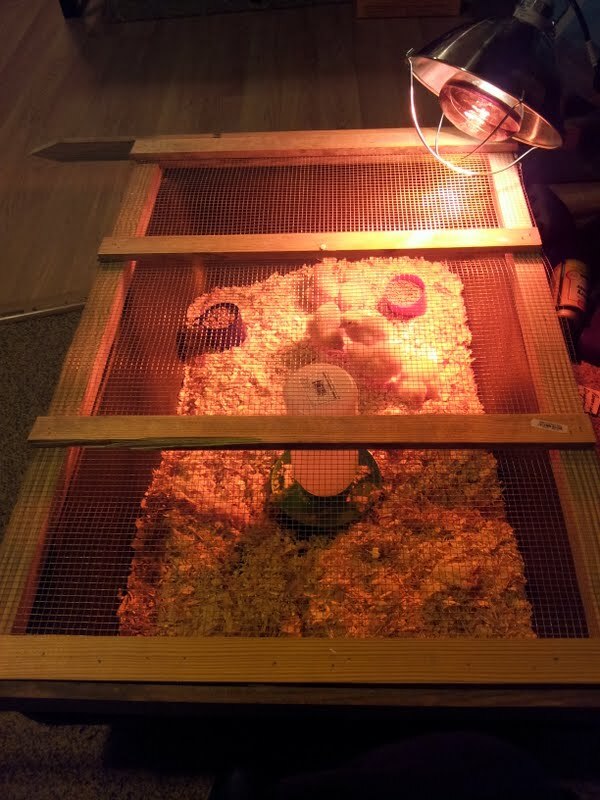 This entry was posted in Livestock, Poultry and Creatures Tame and Wild, Tools and Equipment and tagged chick brooder, ohio brooder by admin. Bookmark the permalink. How many chicks do you plan to have? We’re planning on 200 and that doesn’t include turkeys. This is great. 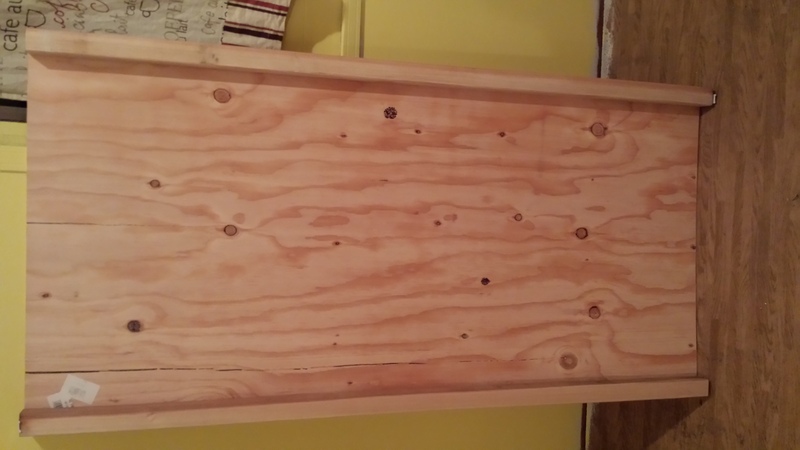 I also learned from Kingbird Farm and build and Ohio Brooder for my new chicken farm Get Down Farm. Thanks!